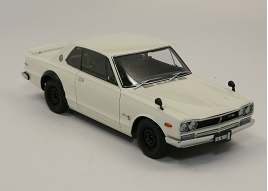 Dating back to 1957, the Skyline name is one of the longest-lived in the history of automobiles. Originally produced by Japanese car maker Prince, which merged with Nissan in 1966, the Skyline was first designed as a compact performance machine for executives. It was certainly compact – and it surely could perform. More than fifty competition titles, and several body- and styling changes later, the Skyline’s story is still being written. A major chapter in that story is represented here in 1:18 scale by AUTOart. 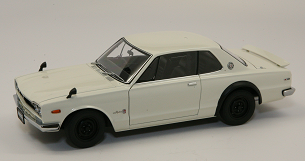 This model replicates the first-generation Skyline to be called a “GTR”, introduced in 1969 as the PGC-10 sedan, then streamlined into this 1970 KPGC-10 coupe variant. AUTOart’s rendition of the coupe has impeccable attention to detail. Taking its cues from the 2000GT-R model, the S20 inline straight six is replicated to a remarkable level; all of the plumbing and factory decals and markings are accurately reproduced. Inside the cabin, the right-hand-drive interior includes faux woodgrain accents, a detailed dash and center console, and bucket seats complete to their photoetched seat belts. Opening the trunk reveals a spare tire, jack, and fuel tank complete with fuel pump and plumbing. With straight shut lines and a relatively unadorned body, and rolling on a set of simple steel wheels and rubber tires, it almost looks humble. Almost.